Children who have braces often feel frustrated and a bit left out as a result of their dietary restrictions. In addition the oral health problems related sugar consumption that all of us have to watch out for, kids with braces face extra limitations when it comes to treats. Many different treats can cause damage to braces, and the braces themselves create more crevices, nooks, and crannies for sugar-eating bacteria to hide in. However, we're not saying that your children must avoid all treats and goodies throughout their orthodontic treatment. We're not that cruel! As with so many other things in life, moderation and common sense are the answer! And as always when it comes to dental health, oral hygiene is key, too. Children with braces can safely indulge in the occasional treat as long as they maintain a good oral hygiene routine, and choose treats that will not cause damage to their braces. The following treats and goodies may not be “recommended” by your dentist as such, but they won’t cause any damage to braces. Chocolate: Chocolate is quite soft at room temperature, so it shouldn’t cause any problems. Stay away from chocolate with extra gooey or hard fillings (nougat, nuts, dried fruit or caramel, for instance). Try: Kit Kat, Reese's Peanut Butter Cups, plain M&Ms, or plain chocolate bars in general. 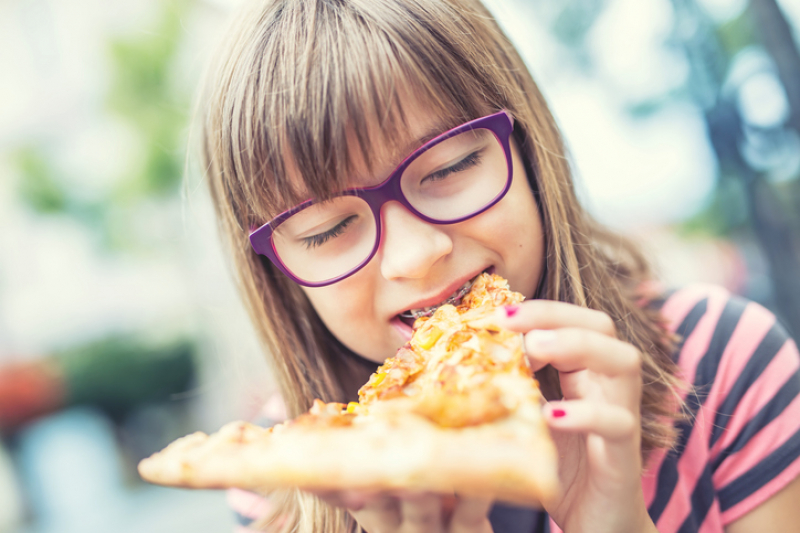 Hot Dogs or Pizza: For a fun junk food meal, hot dogs and pizza are great choices, and it would be nearly impossible to damage braces on them. Ice Cream, Milkshakes or Frozen Yogurt: soft, sweet, creamy and delicious, none of these treats are hard or sticky enough to do damage to braces. Soft, Freshly-Baked Cookies: Again, just be sure to avoid hard or gooey add-ins like caramel or nuts. Soft Pretzels: The pretzel place in the mall food court will likely have lots of flavour options (both sweet and savoury) as well as dips. Soft pretzels perfectly safe for braces. Treats and junk food should always be enjoyed in moderation. As long as they exercise restraint, choose wisely and are careful to brush and floss after indulging, children can enjoy treats while wearing braces without worry! If you have more questions about eating with braces, check out our health and nutrition blog, or contact our North Delta children's dental office today!